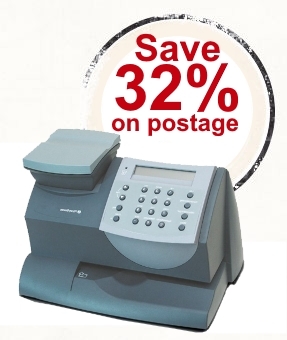 Franking machine prices vary depending on the volume of post you want to send. There are a number of recommended manufacturers and suppliers of franking machine which you can find on the Royal Mail website but hopefully we’ve save you a bit of time and details what you need to know below. The easiest way to get a whole market view on what a new franking machine will cost your business is to get multiple quotes for comparison. This can be time consuming and not all prices are published. At Business Quotes we have access to the best franking machine deals in the UK through our network of suppliers. You can get free franking machine quotes here. If you’re choosing to buy a franking machine outright you’ll need one that not only copes with your current volume but also your expected future volume. Generally, franking machines are classified into 3 types ; Low Volume, Medium Volume and High Volume. The table below outlines what you can expect to pay if you chose to buy a franking machine. There are of course second hand machines available from specialists and well known online auctions websites, but we’d advise against this option as you’re more likely to inherit early wear problems. It’s clear that prices vary massively, this is due to the varying levels of technology involved as well as automation levels. Investing in a franking machine will save your business money in the medium to long term and there are plenty of finance deals available if you have high volume requirements. If you compare purchase with rental you will get a better deal on the price of the machine by buying one, just not the service levels that come alongside many rental agreements. £1,000 looks like a large investment for low volume users but if you’re confident that your postage volume won’t decrease over the coming years it still represents a good investment, just a longer payback time. There are several well known manufacturers of franking machines in the UK below we’ve listed the most popular models by volume size. If buying a franking machine outright represents too much of a capital outlay for your business then franking machine rental is another option and the most popular. The advantages of franking machine rental, other than spreading the cost, is you normally get service/maintenance with your rental agreement. These extras aren’t exactly free and you will pay more for the machine over time than buying but you’ll have the convenience of less down time should your machine develop a fault or need updating. Finding franking machine repair men is not so easy, there’s only around 20 companies in the UK that can fix or update the software. Again rental prices are calculated on usage, the table below illustrates what you can expect to pay on a monthly basis. *Intended as representative figures only. Actual quotes will vary. How Much Will You Save on Postage Costs? The whole point of getting a franking machine is to benefit from reduced mail costs. Regular postage costs are 32% more expensive compared to Royal Mail’s lowest franked service MailMark®. Below you’ll find savings per items based on Royal Mail prices, January 2018. Don’t forget these extra costs! When calculating franking machine prices don’t forget that regardless of whether you buy or rent there are extra costs to consider. Franking machines use ink cartridges and labels so you’ll need to factor in this cost which could be anywhere from 1P to 5P extra per item. Royal Mail will update their postage prices, the last one was in March 2017. When they do this you’ll be charged for updating your machine unless it’s part of your rental agreement – it’s worth checking if this is included in any rental agreements before signing. Your Franking Machine will be linked to your Royal Mail account which requires prepayment (there’s no credit or invoicing). You can be charged as much as 5% for each top up! When you sign up to Royal Mail’s franking services you will be required to get your franking machine serviced every year as part of the agreement. If you’d like to save a lot of time getting prices from each provider, we can do this for you. There’s no charge for this service, we are paid a small commission for providers if you choose their service.